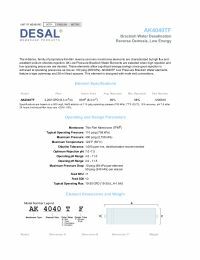 The GE Osmonics Desal AK4040TF Thin Film RO Membrane Element is part of GE Osmonics A-Series family of proprietary thin-film RO membranes. These low pressure brackish water elements are characterized by high flux and excellent soldium chloride rejection. They are ideal for use when high rejection and low operating pressure is desired. Because they are able to achieve good rejection at low operating pressure, these membranes allow for significant energy savings. They features a tape outerwrap, 28 mil feed spacers, and male end connections.